Publishing Information: Self-published mini-comic, eight pages, 2006, no price. Souther Salazar made a intriguing statement during the Masters of Alternative Comics panel at Comic-Con International 2006, that he worked the way he did on comics because trying to do comics like the Hernandez Brothers was not only hard but it was nearly impossible to replicate the quality of their results. 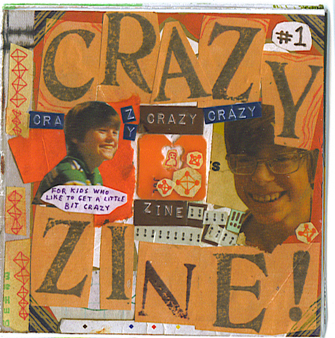 Crazy Zine! reads like one of the natural fruits of Salazar's approach to make the work enjoyable as he goes, a handmade micro-mini stuffed with comics, art, photos, jokes and doodles. The subject is "crazy," reminiscent of a children's book on the subject, where the word crazy is thrown around a lot but nothing really crazy goes on (an admission Salazar makes through a proxy on the back cover). The books does a nice job showing off what Salazar likes about art, as well as his skill with pithy phrase-making. It may not stand out as anything different than Salazar's previous work, but it's nice to have another mini from this artist, period.